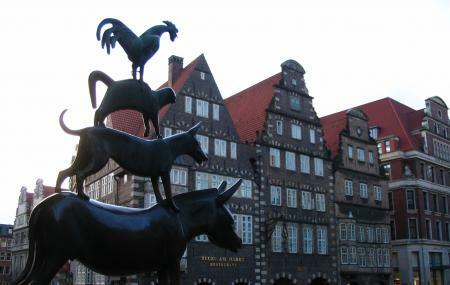 Find hotel near Town Musicians Of Bremen .. This is folktale that was recorded by the Brothers Grimm. The title or the characters never arrived in Bremen though. It is story of donkey, a cat, a rooster and a dog. What are here for the tourist to see are the modeled statues of these animals, called the Town of Musicians. The statues reside in front of each of the five veterinary schools in Germany. They were all gifts given to the schools. How popular is Town Musicians Of Bremen Or Bremer Stadtmusikanten? People normally club together St. Peter's Cathedral and Marktplatz while planning their visit to Town Musicians Of Bremen Or Bremer Stadtmusikanten.